When I asked Gerry to pick up some apples so I could make sauce I didn’t expect him to bring home fifty pounds of apples! 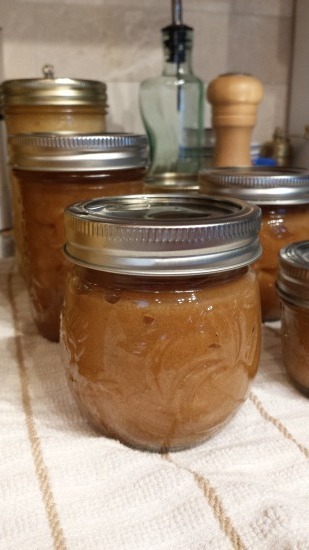 I’m glad he did though, as it afforded me an opportunity to try a couple of new recipes like this one for apple butter. Apple butter is new to me. I had occasion to try pumpkin butter spread on toast last year and really enjoyed it so I thought that apple butter would be tasty too. For those, like me, who are unfamiliar with fruit butters it may surprise you to learn that there is no actual butter in it. I expect that the term butter comes from the smooth texture of the product that is ideal for spreading on bread, toast, or crackers. I found many recipes for Apple Butter but this one was, by far, the easiest. I also like this one because it has less sugar than many of the other ones. I found it on the Simple Canning site. Yield: I got eight random-sized jars (smaller than the 12 ounce jelly jars) out of this batch. Peel, core, and slice apples. Put them into your crock pot filling it up to the brim. Mix together sugar, cinnamon, cloves, and salt. Pour over top of the apples. Put cover on crock pot leaving it very slightly ajar to allow moisture to escape so the apple butter to thicken. Turn down to low and cook for about 10 hours stirring occasionally. You may want to leave the lid off during the last hour or two depending on how thick it looks. Eventually, you will be able to use a whisk to further break up the apples. The recipe suggests you start this at night and cook it overnight. I am not sure how this would work since I did need to stir the apple mixture periodically. My recommendation is to start it very early in the morning and let it cook all day. When the apple butter is cooked down and is a beautiful dark colour use an immersion blender to break up any remaining chunks of apple to create a smooth butter. Fill jars (I used the smallest jars I had–smaller than half pints.) leaving 1/4 inch head space. Wipe rims to ensure they are clean and apply lids and rings. Process in water bath canner for 10 minutes.